Let’s talk about the basics of chakras today. Everything in your body is comprised of four main elements: earth, air, water and fire. Fire is your energy—it’s what your body creates to burn as fuel so you can launch your life into action. Water is the element found in the liquids of your body that carries waste out. You breathe air to bring life to your organs. Earth is found in your bones and muscles. As you can see, you are a walking, living, elemental being. So where do the chakras come in? 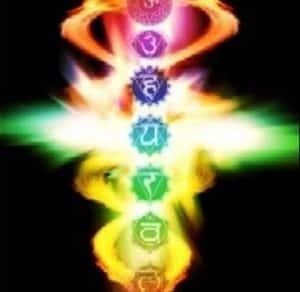 Chakra means “wheel of energy.” They are what keep the elements in harmony throughout your body, whereas the aura is the emanation of that energy around your body. There are seven chakras along the “main,” aligned with the spine, and the “minor,” which are the hands and feet. Each are associated with a color, element and part of your being. The first chakra, the earth, located at the base of spine, is associated with the color red and deals with all things physical. The second, water (orange), located two fingers below the navel, deals with emotions. The third chakra is fire (yellow), located three fingers above the navel, and deals with the mind. The fourth, air (green), located in the center of the chest, deals with your spirit. The fifth, sound (aqua blue), is located at the base of your neck. The sixth, light and vision (indigo), is located in the center of your brow, between your eyes. The seventh, the universe or divine (violet or white gold), is located at the top of your head. The chakras are very important to your evolution on earth. The most important are the first three. We can get into advanced lessons later, but for now, I want you to focus on one at a time for 10 seconds. Visualize a spinning wheel, with the color getting brighter as you think about the elements in your life and what they mean to you. Ask yourself how much time you spend in nature, exercising and eating healthy, which deals with the earth chakra. What about the emotions you feel? Do you take baths, walk on beaches and nurture yourself? That deals with the second chakra. For the third chakra, do you read, continue to learn and expand your thinking? Are you flexible in your beliefs? Do you empower yourself with wise words and knowledge? The fourth is easy—do you love unconditionally? Are you open to love? Do you receive openly without guilt? Do you give without expectations? The fifth chakra is all about your ability to be clear in your truth and power—do you listen well to others? What kind of music do you like? Are you honoring yourself? The sixth is about taking time to dream, think and envision your highest possibility. Do you like colors and beauty? Are you willing to see what’s real? The seventh chakra is about connecting to Source though meditation and focusing on life and spirit. While you’re paying attention, notice how you feel in each area. What sensations or impressions come to mind? Write them down. Take notes. Remember, these are the basics—it’s a start to your journey into understanding your chakras more and experiencing them in your life. Do this with ease, relax and keep being the amazing, beautiful person you are. Let me know what you think or if you have questions.